The new City Gear Backpack protects laptops with up to 17" widescreens. This extra-large backpack has reflective trim on the exterior and includes 3 large compartments for a laptop, books, binders and accessories. For comfortable carrying, it has mesh-padded shoulder straps and back panel, and a molded carry handle. Other features include a front organizational compartment with an MP3/CD player pocket, and a key clip and pen loops. 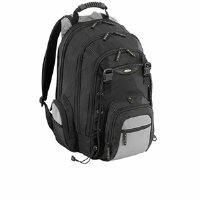 This backpack has plenty of document and accessory storage, as well as a removable CD/DVD sleeve that holds 8 discs and a side pocket with a soft lining. With space for all of your accessories, the case is perfect for the student, business traveler, or outdoor enthusiast. This has the potential to be a great bag, but doesn't quite get there. I replaced a 7-year old Targus backpack that finally gave out, after >100,000 miles of air travel - the zipper for the main laptop compartment broke. Great product, so I thought - we'll go with Targus again. Wrong. This bag had potential - TONS of storage, lots of pockets, some nice features advertised, so I ordered it. When it arrived, I noticed a significant decline in quality - the nylon is thinner, cheaper, and the laptop storage compartment has almost no padding to speak of. The zippers are cheap - go back to YKKs or at least something with a substantial track and closure mechanism - these won't last. So I needed a very large capacity backpack with a compartment to safely carry a 15 inch laptop, and I got it. Ample space, and its not cluttered up with file organizers, or zippered pouches, or any of that crap which you will almost never use which just ruins the space, so that was good. It doesn't seem cheap, just thin and almost weak. I have it loaded down with 4 text books, all my school supplies, and a laptop, and it is holding up fine, I think it could have been made a little 'sturdier' is all. I'm not disappointed at all though. Good bag if you need to carry a library on your back.